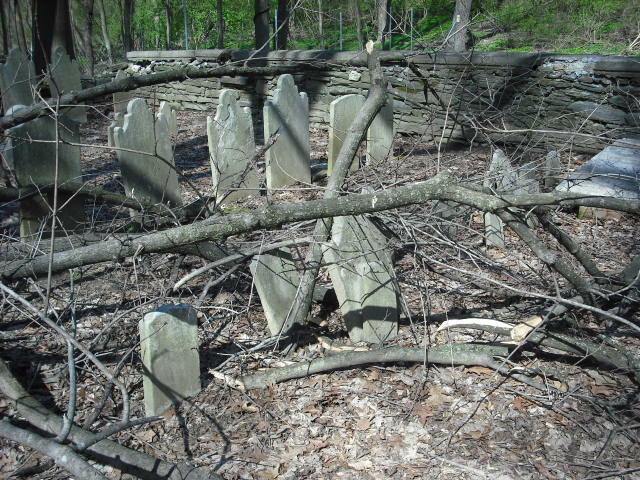 The Yeakel Cemetery is located in Wyndmoor, Springfield Township, Montgomery County, Pennsylvania, about a quarter-mile from the Philadelphia line north of Chestnut Hill. It was once owned by the Mack family of Germantown and used as a place of interment prior to 1753. Here are buried some of the earliest residents of Chestnut Hill and Springfield Township Montgomery County. The cemetery is over 200 yards back from Stenton Avenue, in a wooded area, behind a rehabilitation center. About an eighth of an acre in size, the graveyard is surrounded by a stone wall built sometime before 1882. An early photograph shows the wall with a shingle cap. Today it has a cast concrete cap with a date stamp that reads 1927. 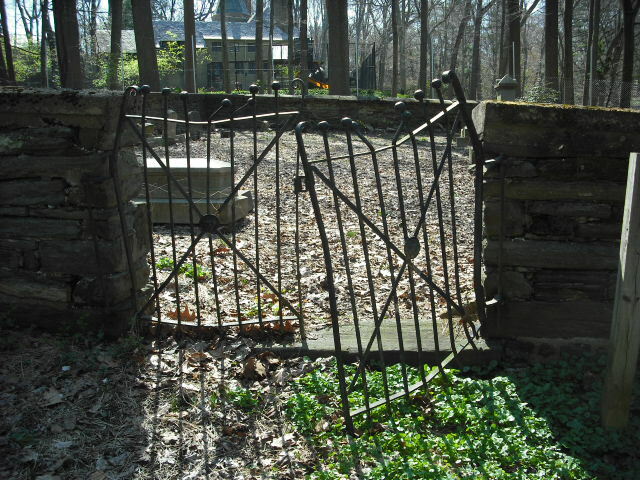 A pair of wrought iron gates, with small lion’s head medallions, completes the enclosure. Inside there are 86 head and foot stones, some dating back to the 18th century. The earliest are made of marble and the inscriptions are fading. The later granite stones are still crisp. There are about two dozen common field stones set in the ground upright, as if to suggest a marked grave. 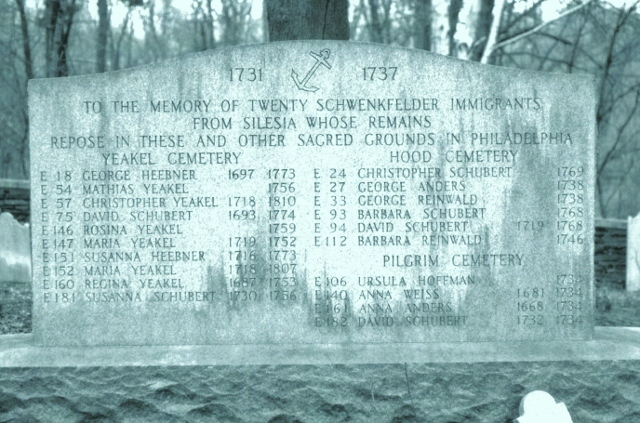 The most dominant feature in the graveyard is a polished granite monument placed by the Schwenkfelder Church to commemorate the 200th anniversary of the Schwenkfelder migrations. The monument, erected in 1931, is inscribed with the names of the immigrants buried in the Yeakel cemetery as well as the Hood and Pilgrim cemeteries. According to tombston e research, there are 53 burials in Yeakel cemetery. The earliest inscription is Maria Yeakel who died in 1752 and the latest is Matilda Heydrick who died in 1902. Some other family names that appear on stones are Dowers, Heebner, Neff, Schubert, Schultz, and Schuman. Other burials may include members of the Eshamann, Kriebel, and Mack families, though no tombstones mark their graves. 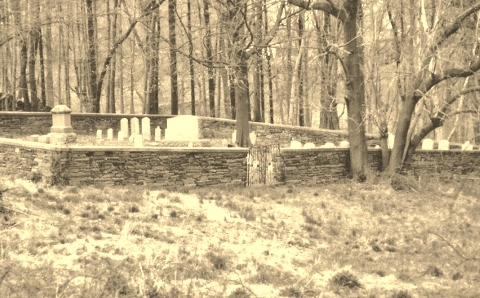 Tradition states that soldiers killed during the Revolutionary War are buried here. This has not been verified; however a skirmish did take place on this hillside. On Dec. 6, 1777 a detachment of 600 Pennsylvania Militia, commanded by Gen. William Irvine, fought with British troops. According to military records, the fight lasted twenty minutes, General Irvine was wounded and captured, and there were 30 to 40 casualties. Four patriots are buried in the cemetery. Lists of associators and militia 1777-1781, include the names Christopher Yeakle (under Capt. James Irvine) from Chestnut Hill and Abraham Yeakle, Abraham Heydrick, and Jacob Neff (under Capts. Baltzer Heydrick and Andrew Redheiffer) of Springfield Township. In 1802 Christopher Yeakle, his sons Christopher Jr. and Abraham, and his son-in-law Abraham Heydrick purchased the burial ground. Additional purchases were made in 1838 and 1847. Every purchase added new names to a growing list of owners. By 1847 seven people had “equal right, title, and interest” to the property. Eventually the land was taken over by the Schwenkfelder Church. Nice website! I appreciate the effort that went into this and the effort that’s going into restoring the cemetery grounds. I had visited the cemetery in 2010. I entered by parking in the back of the rehab center. Access to the cemetery was blocked by a newly built chain link fence. Is there a way to access the grounds without having to scale that fence? As a suggestion, it might be helpful to post a map of the grounds showing the path to it. Another item that might be nice would be a map of the cemetery layout showing who is buried where, and indicating the numbering system used on the 1931 monument. My closest Yeakel connection is Emily Yeakel (10/15/1839-7/21/1923) who married Joseph Nash. She is my great-great grandmother. Emily was a daughter of Joseph Yeakel and Elizabeth (Huston) Yeakel. Joseph Yeakel’s parents were Jacob Yeakel and Gertrude (Urffer) Yeakel who are buried in this cemetery. Again, thanks to all who have been helping with this project. This is amazing! I have been able to trace our family all the way back to the original immigrant, Regina Yeakel (Jackel), Christoph’s mother. I hope to visit this cemetery next time I am in town.This piece of history is amazing and I appreciate how it has been maintained so that their descendants can still go there today. I am truly blown away! Thank you for all that has been done and continues to be done. So glad you found us Chrisdin. Check in with us again soon as we are planning to have tours this summer. Watch for details. I love what you guys and gals are doing here. I also find the “Jackel” and anglocized spelling of “Yeakel” very interesting. My last name has been through a few modifications over time and it’s always fun to discover these little nuggets of knowledge in our family histories. I will eagerly follow the progress from way down in NC. Keep up the great work!